As the recent presidential campaign revealed, the Vietnam War remains a political lightning rod. In the 1980s, even as a Gallup poll listed Fonda as one of the most admired women in the country, “Hanoi Jane” had become a reviled figure among conservatives for her highly publicized trip to North Vietnam in 1972. Today, according to a recent poll, millions of Americans continue to link Fonda’s name to Vietnam—yet the true history of her antiwar work has been largely obscured. One of the most popular movie actresses of the 1960s and 1970s, Fonda was also among the most committed and visible antiwar activists of the era. 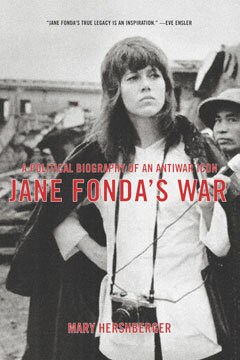 Coming on the heels of Jane Fonda’s own memoir, this is the first book to document one of the most interesting (and least known) chapters in Fonda’s life—including the first comprehensive account of her controversial trips to Hanoi, as well as her extensive efforts on behalf of American GIs. Based on unprecedented access to Fonda’s twenty-foot-thick FBI files, interviews with the former POWs Fonda met with in Hanoi in 1972, and a broad range of contemporary press reports, Jane Fonda’s War is a fascinating and little-understood chapter in the extraordinary life of an American icon. Mary Hershberger is a professor of history at Capital University in Ohio and the author of Traveling to Vietnam: American Peace Activists and the War. She lives in Columbus, Ohio.